Here's a treat for you from Globe and Grabtaxi, if you’re using this smartphone booking app to get taxi nearest on your area you'll be getting 20 pesos discount if you’re a Globe or TM subscriber. Aside from the discount, you are sure of getting trusted taxi drivers of the company that will send you to your destination safe and sound. To those who have not tried this free taxi-booking app, just download it on Google Play store or App Store by searching the workd Grabtaxi. It's available for Android and iOS users. 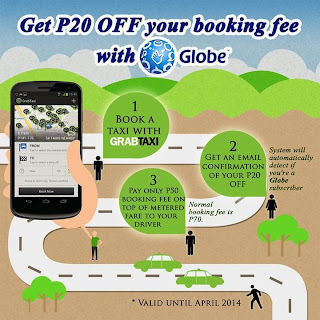 How to get P20 pesos discount in GrabTaxi app? Book a taxi using GrabTaxi iOS or Android app. Get an email confirmation of your P20 off, this will be automatically detected if you're a GLobe or TM user. Pay only 50 pesos on top of the metered taxi charge. That's all guys, this promo is valid until April 2014. If you think this offer is cool for you, hit your comments or you can share this information to all your friends by clicking tweet or like button.